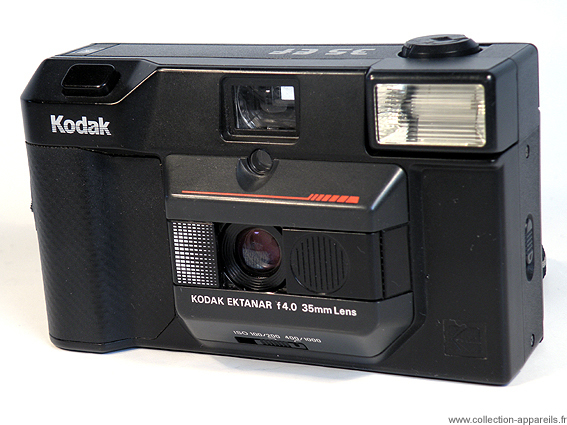 After sixteen years of absence in the market of the 24 x 36 cameras, Kodak came back with three new compact cameras simultaneously. Kodak probably did not have enough production facilities to manufacture them and therefore subcontracted it to Chinon. The design and manufacture of glass lenses were nevertheless carried out by Kodak itself in the United States. The first camera of this renewal, the EF 35, have a design obviously behind the production of the time. Unattractive, they are black plastic, while many manufacturers followed the fashion of the 80s with very bright and sometime fluorescent colours. The opening, sliding the lens flap cover causes the startup of the unit. All functions are manual. A red LED will light in the viewfinder when the CdS cell detects that there is not enough light, the photographer must then set the flash manually by operating a slider located at the base of the body.